These Banana Bread Date Bars are made with no added sweeteners, whole grain flour, no oil, and are super moist and flavorful! They make a fabulous healthy treat. Heads up! This recipe was first published in March 2014. Photographs were updated in July 2018. Text and recipe were not changed. Ever since I got back from my Arizona trip, I’ve been trying to wake up at the same time I usually do. 6am is 3am in Phoenix, so I’ve had to force my eyes open and the rest of the day I’ve felt like I’m in a fog. I have lead feet as I try to do everyday tasks. I’m hoping it’s just jet lag and this will pass because I don’t like going through life feeling so tired. The good thing is these Banana Bread Date Bars are a cinch to make and I was able to make them even despite my fatigue. I made these as an attempt to satisfy my family’s sweet tooth with something healthy. I wanted something that would be tasty enough for dessert, yet healthy enough to be eaten for breakfast or a snack. 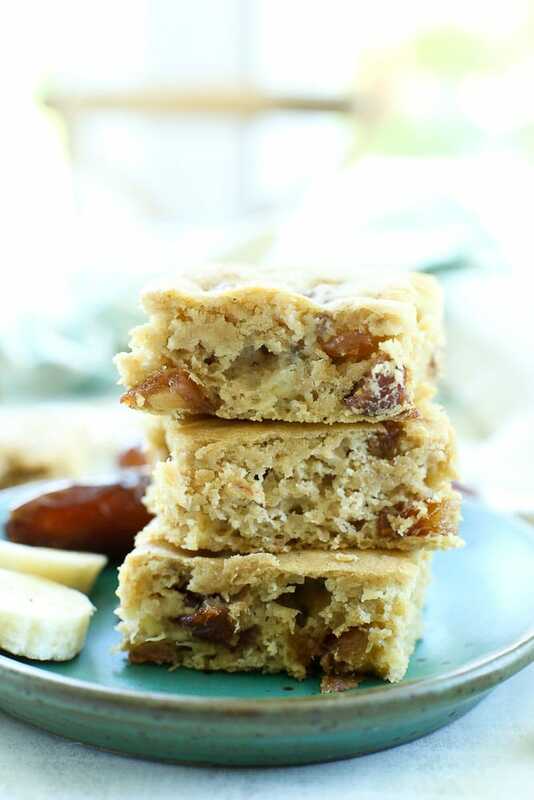 Enter the Banana Bread Date Bars! 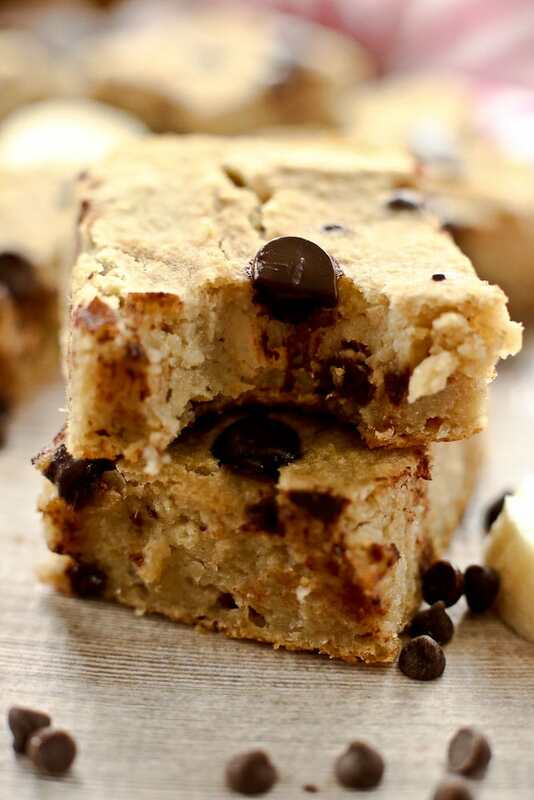 These bars are a cross between banana bread, cake, and a snack bar. They fit the bill perfectly if you are looking for a truly healthy treat. 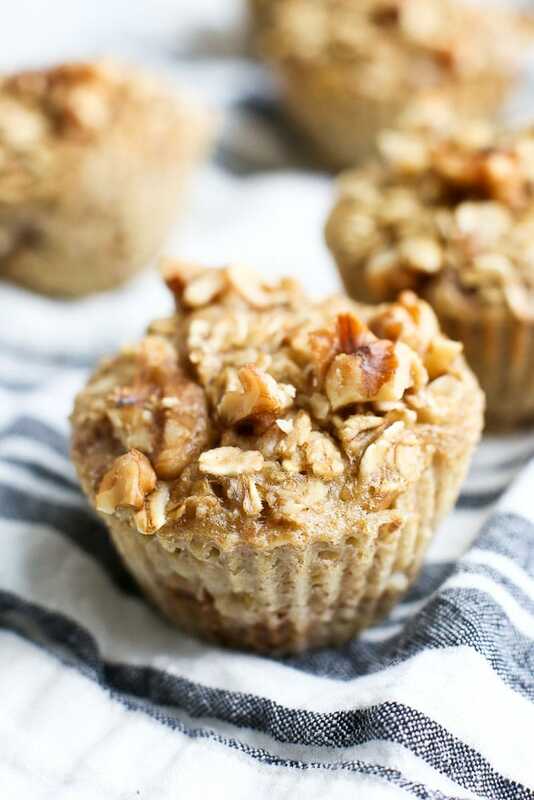 There are no added sweeteners in this recipe and it’s made with 100% whole wheat flour. All the sweetness comes from the bananas and dates. Applesauce has also replaced any oil, so they are lighter than your usual dessert or snack bar. 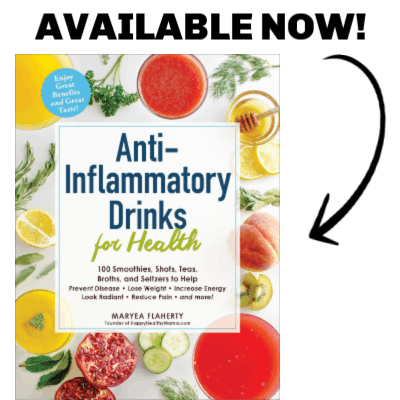 Despite these healthifications (that’s a word! ), they are bursting with banana flavor and are super moist. Even better? They are very quick and easy. This is a one bowl recipe. I whipped this batch of Banana Bread Date Bars up while Luke was eating his lunch. It doesn’t get any easier! 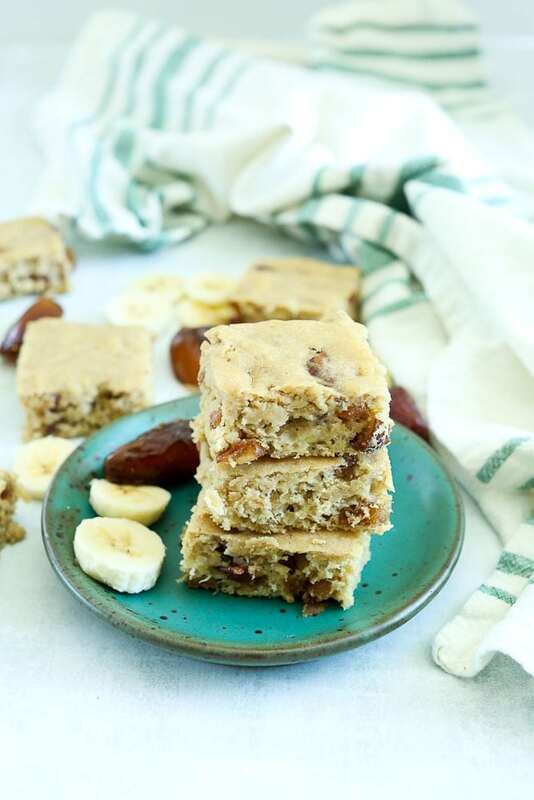 A cross between banana bread, cake, and snack bars, these are a healthy treat! With no added sugar, no oil, and 100% whole wheat flour, you can feel great about serving these to your family. Preheat the oven to 350 degrees and grease a 9X9 inch square baking pan. In a bowl, mix together the mashed banana, applesauce, egg, and vanilla. Stir well. Add in the flour and baking powder and mix until almost combined. Stir in the dates and mix the rest of the way. Don’t over mix the batter. Bake in the preheated oven until the sides start to pull away from the pan and an inserted toothpick comes out clean, about 20 minutes. 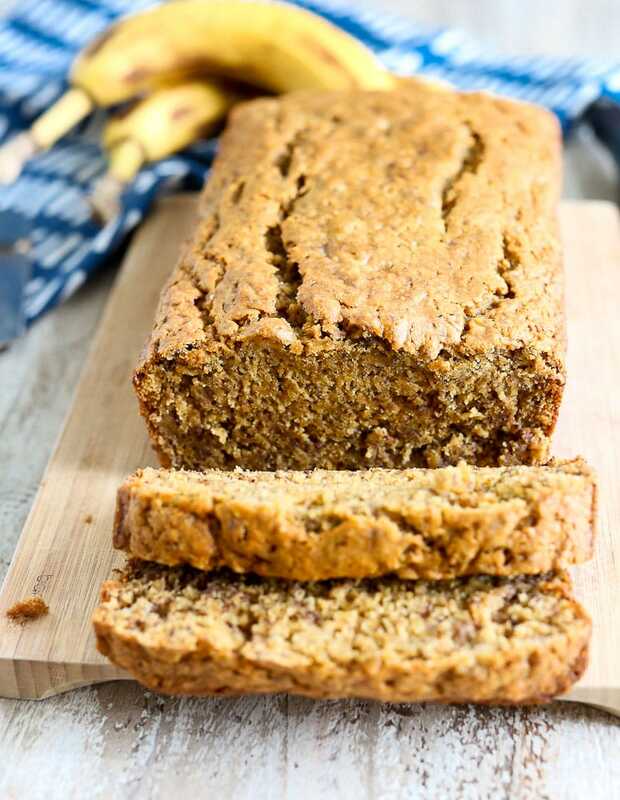 Love baking with banana? 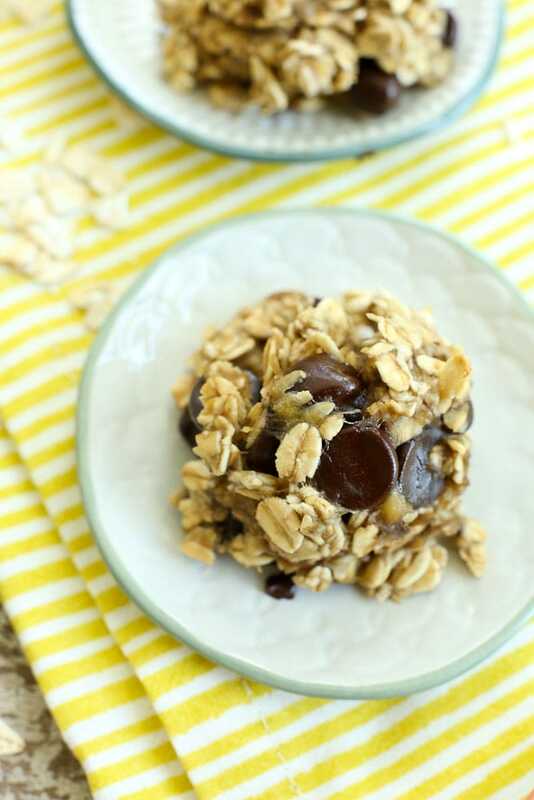 Try one of these favorite recipes with bananas! And here I was saying “what am I going to do with all these ripe bananas and leftover dates?”. Problem solved…will be trying these this weekend! Dates are such a wonder-fruit. (not a word, made it up) I keep a bunch on hand for recipes, but more and more I find myself just snaking on them when I want something sweet. These look gooey and delicious and of course I absolutely love that they are so healthy. These look just perfect. I’ll use an egg replacer since my Little Guy can’t have eggs, but I’m guessing it will turn out great! Your cake looks so yummy. I will try it. Hi! I was wondering if I subbed in regular AP flour or white whole wheat flour if it would still turn out ok? I don’t have any pastry flour… thanks! We don’t have applesauce here in India . Can I replace it with something else ? You can use an oil instead. Or, if you don’t want to use that much oil, try 1/4 cup more mashed banana and 1/4 cup oil. Let me know how it goes! Do you think I can substitute almond flour? I haven’t tried that, sorry. I’ll let you know if I do! Hey there! Have you every tried these with an almond or coconut flour? I have not! The recipe may need to be tweaked a bit, but I think it could work. I’ll see if I can try it this weekend and report back!